Amazon.com description: Product Description: Dr. Oz s personal trainer Donovan Green delivers a thirty-day fitness program focusing on exercise, diet, and attitude, forged from his experience training thousands of clients ranging from regular folks to celebrities.Between his positive, can-do spirit and his practical, brass tacks strategies for getting in shape, it s no wonder Donovan Green has reached 3.7 million daily viewers via his unique No Excuses platform on "The Dr. Oz Show." 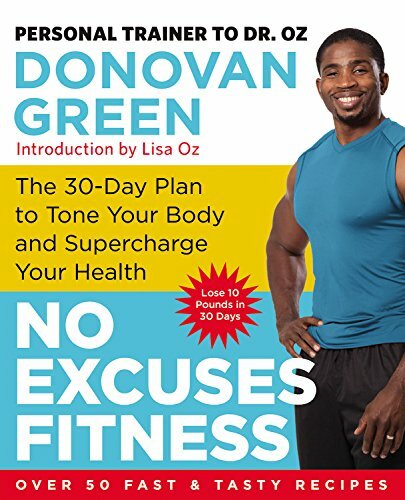 With "No Excuses Fitness," Green delivers a fully comprehensive month-long plan designed to help readers lose ten pounds in thirty days. Filled with healthy recipes, workouts that can be done anywhere and with minimal equipment, daily tips for staying focused (especially through plateaus), and featuring a foreword by Dr. Oz s wife Lisa, "No Excuses Fitness" will inspire and guide anyone interested in losing weight and gaining optimal health." With Lisa Oz (other contributor), Adetokumboh M\'Cormack (other contributor) | Com/cdr un edition from Blackstone Audio Inc (April 14, 2015); titled "No Excuses Fitness: The 30-Day Plan to Tone Your Body and Supercharge Your Health: Library Edition"